My Flat Utility Leash from Stibbar Leather is my new favorite. This is the softest leather ever, no breaking in period required. It is light, supple, and easy to jam into a pocket despite being 6' long. The hardware is light and tiny, and the rings aren't heavy enough to bonk my dogs in the face. With three floating rings, two fixed rings, and a snap on either end, I can do anything with this Euro lead. Stibbar leads are custom made, with 15 different color options, multiple hardware choices, and six standard lengths. They seem to be willing to make pretty whatever you can dream up, too. 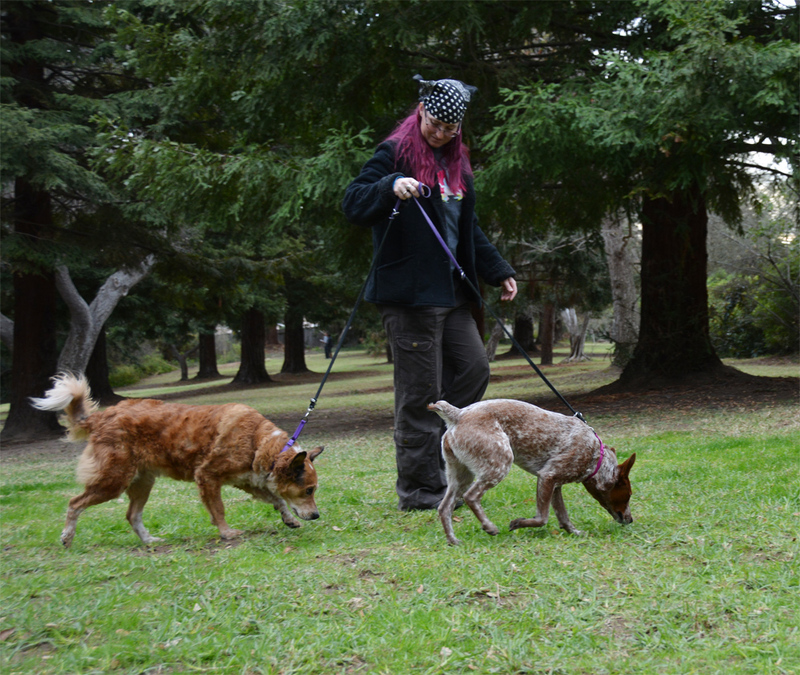 I've tried out and reviewed dozens of collars and harnesses, but only a handful of leashes. This is because I am incredibly picky. Those adorable matching collar and leash sets do nothing for me because I really only love skinny leather leashes. The lighter and more supple, the better. I can't stand bulky leashes, and I hate heavy hardware. Stibbar specializes in braided leather products. They offer everything from super-tiny show leads for toy breeds, to massive chunky leashes that can be used as lead ropes for horses. They also make collars, martingales, martingale leads, keychains, training tabs, and can probably make anything along these lines. I love that the Stibbar site includes pictures and measurements of all their hardware and options. 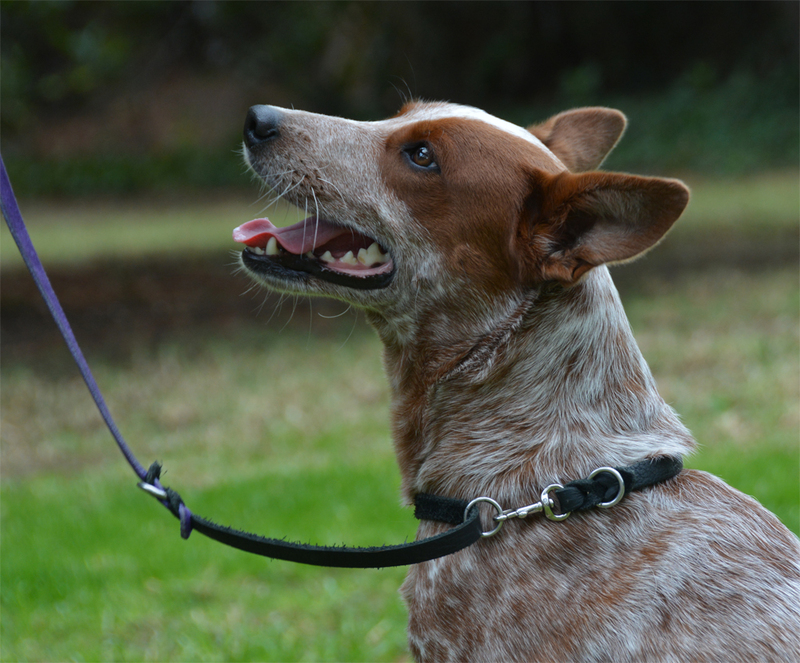 It allows you to go "Wow, this would be my dream leash with this minor change..." and then make that change and get The Perfect Leash. 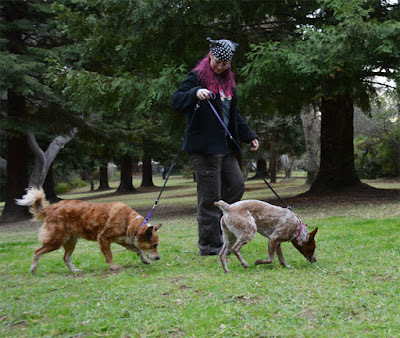 Granted, there's no single leash that is perfect for everyone, but Stibbar has so many options that it's possible to create something that solves whatever issues you have with your current gear. My utility leash is made from 3/8" super-soft bullhide. It is made in three sections that are braided together, with a fixed ring at each braid. There are also fixed rings at either end just below the snaps. Each end has a snap, and then each of the three sections has a floating ring. 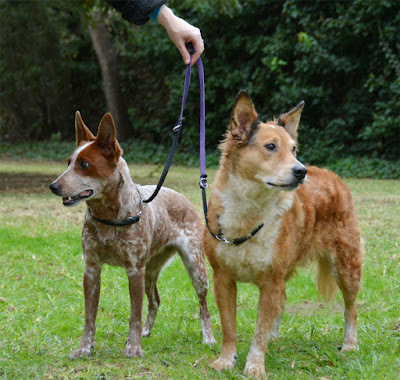 This allows the leash to be used for two dogs at once. Clip a snap to a floating ring and it can be a slip leash. 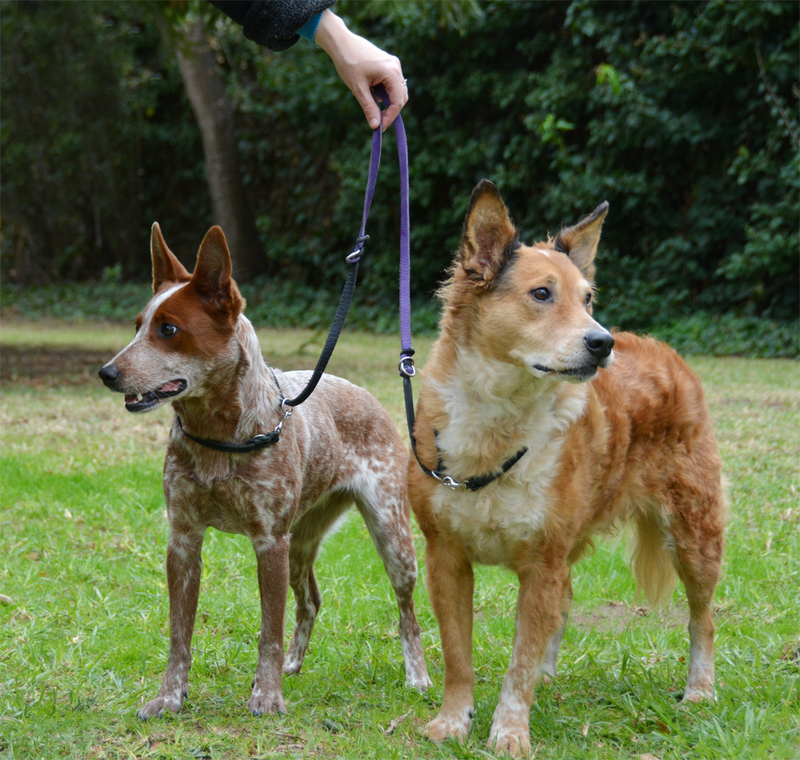 Unlike any other utility leash I've found, this one can be used as a slip leash for two dogs at once. It is also amazing for wearing around my waist or over my shoulder, and tethering my dog to things around the house. Most of Stibbar's braided products use a lot of leather and run around $50 per piece. This flat leash is light and floppy and easy to gather up in my hand or stuff in my pocket. It is probably prone to stretching, but it doesn't see a lot of tension because I've taught my dogs to walk on loose leashes. Pros: Super light, flexible, easy to stuff into a pocket. Really nice grippy feel with precision control. Double snaps mean it can be clipped to both rings on the Freedom and Balance harnesses, or to a head halter and harness as a backup. Lightweight hardware doesn't bonk sensitive dogs in the face. Looks brand new after several months of daily use. Strong enough to hold up to multiple days of lure coursing insanity. Cons: Mostly just for smaller and well-behaved dogs, otherwise would need to be made with wider leather and heavier hardware. Definitely not chew-proof. A habitual puller would likely stretch it a lot. Bottom Line: Super functional and just so pretty!